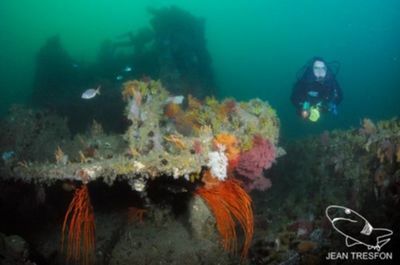 The dive site MFV Princess Elizabeth is a recent wreck in the Smitswinkel Bay area on the Cape Peninsula side of False Bay, near Cape Town in the Western Cape province of South Africa. 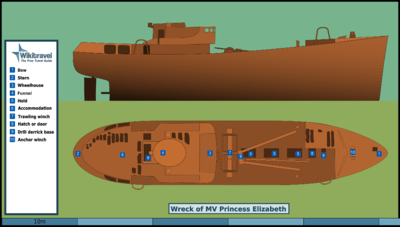 The MFV Princess Elizabeth is the central of the 5 wrecks in Smitswinkel bay. The "MFV Princess Elizabeth" was built in 1961 by Cook, Welton and Gemmel Ltd, of Beverly, East Yorkshire. The trawler was badly damaged by a fire and was donated to the False Bay Conservation Society along with the Orotava by Irvin and Johnson. In August 1983 the vessels were towed out to Smitwinkel Bay and were scuttled. The Princess Elizabeth is the smaller of the two trawlers and lies on the sand at 36 metres with a slight list to starboard. The depth at the top of the wreck is about 28 metres. Sand bottom is at about 36m and the top of the wreck is a bit shallower than 28m at the top of the wheelhouse. Visibility is subject to the same conditions as the other Smits wrecks. It varies from a few metres to over 20m on a very good day. Visibility also may vary with depth, and it is not unusual for a surface layer of poor visibility to overlay much better visibility on the wreck. In such conditions the water at the bottom will usually be relatively clear, but may also be very dark. In these conditions a dive light is particularly useful, though visibility is unlikely to be too poor to see anything without illumination. The wreck is in fairly good condition. Hull plating is almost intact, but decks wasted in places, with a few big holes between frames on the forecastle and on the quarterdeck. Interior under quarterdeck looks accessible from the sides of the main deck. The front and part of the deckhead of the wheelhouse are missing. 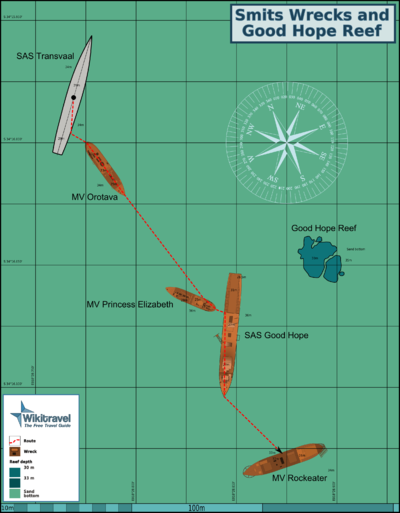 The wreck of the Princess Elizabeth is more or less upright on a flat sand bottom, listing about 5° to starboard. The gap from the Princess Elizabeth to SAS Good Hope about 10m directly astern. The vessel has a raised forecastle and quarterdeck with tumble-home on the quarterdedck and a slightly raked bow and moderate flare forward. The stern is rounded, with a conventional rudder and single propeller aperture (no propeller). The superstructure is basically a wheelhouse deck which slightly overhangs the deck below on both sides, and to a lesser extent, forward. There is a large winch on the waist deck just forward of wheelhouse, and three hatches with fairly high coamings in line forward of the winch. Forward of this on the port side is a shelter continuous with the forecastle, and a hatch on the centreline smaller than the three closer to the winch. There is also a much smaller hatch offset slightly to port and slightly forward of the other, wider hatches. On the starboard side just behind the forecastle there is a heavy davit which was part of the trawl net handling gear. The bipod mast has been cut down and is lying on the waist deck with its top just forward of the winch and the topmast over the starboard winch drum. The bases of the mast tubes are still fixed to the deck near the bottom ends of the cut off part. The mast partially obscures the aftmost of the three main hatch openings on the waist deck. The tube forestays are also on the deck. The funnel appears to be reduced from its original height as it only projects about half a metre above wheelhouse deckhead. Funnel top is about 3m wide, maybe 4m long. The deckhead of the forward part of wheelhouse and the forward bulkhead are missing, but the side bulkheads still stand. There is an anchor winch on the forecastle forward of a wavebreak. Penetration of the fish holds is possible from the waist deck via two moderate sized hatches. Access is straightforward and the hold spaces are fairly open and free of major snags. A machinery space under the wheelhouse is accessible from the aft end of this hold through a large opening in the bulkhead. This space is also fairly open and free of major snags and obstructions. The wheelhouse is easily accessible through the missing forward bulkhead, and the space is free of significant snags and well illuminated. The forecastle is accessible through a large clear opening at the break, which leads into a fairly dark compartment which is aomewhat cluttered forward, with a moderate size hatch in the main deck leading down into a small hold space. Between this hold space and the main fish hold there is another hold space accessible from the forward end of the waist deck through a moderately large and clear hatch. The quarterdeck area is partly sheltered and this part is accessible along the main deck on both sides of the superstructure. There are also holes in the deck plating giving very tight access to this area, and a good amount of natural light. The interior of the superstructure is rather tight and cramped, with narrow doors and small compartments and passageways, where it is probably not possible to turn without making contact with the structure, and the organisms living on it, or the silt in the decks. Most compartments have a moderate to large buildup of silt on the bottom surface, but it is not particularly fine, and there is often water movement from surge, so the silting risk is not particularly high. Flat fine white sand bottom all around the wreck. The site is exposed to swell from the south east, and to a certain extent, from the south west. Longer period swell will make conditions on the wrecks uncomfortable or hazardous due to strong surge, but short period waves will just make it uncomfortable on the boat. Visibility is less predictable, and at this time is largely a matter of luck and reports from divers who were in the area recently. The site is usually at its best in winter but there are also occasional opportunities at other times of the year, though least often in summer, when the south east wind tends to blow much of the time. This site is only accessible by boat. It is about 5.25km from the slipway at Miller's Point. The wreck is too deep for much seaweed, but it is heavily encrusted with invertebrates, some of which are seldom seen anywhere else but the Smits wrecks. Fairly intact wreck of a steel side trawler. The fishing gear winch is still on deck and easily identifiable, as is the anchor winch. No particular route recommended. Penetrations are tight and limited by the small size of the vessel. Scorpion fish have been seen on the wrecks, and are well camouflaged. Their spines carry a dangerous venom. Certification appropriate to the depth is expected. Some level of training or experience in wreck diving is recommended, and penetration should only be attempted by suitably competent divers after reconnaisance and appropriate planning. Equipment appropriate for the depth should be used. Nitrox is recommended for those competent to use it. A light is strongly recommended, and penetration should not be attempted without the appropriate equipment and planning. If you are not entirely certain what this would be, you are not competent to do the penetration. This page was last edited on 4 August 2012, at 18:02.